The Gikuyu woman’s house, Nyumba, was the centre of the family traditions and ceremonies just as the Fig tree, Mugumo tree was the centre of tribal ceremonies. Its sacred position in Gikuyu psyche can be likened to that of a temple in Hindu psyche. Indeed the characteristics of a temple are clearly visible in the Gikuyu Nyumba. 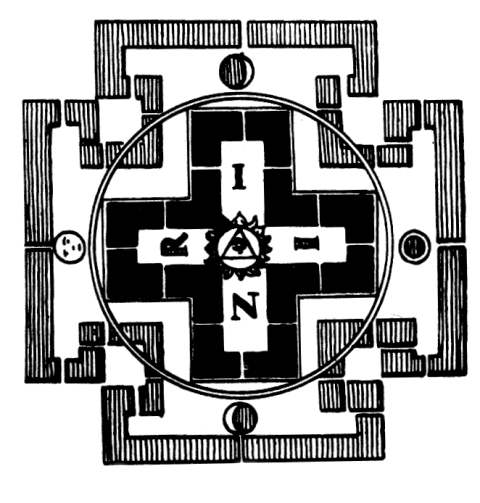 The four cardinal directions, place of ritual, symbolic geometry, elemental clarity and lucidity yet embodying secrecy and mystery are a just a few of the underlying themes of the Nyumba. Below is an annotated plan of the Nyumba from the PhD. Thesis, “Transformation of Kikuyu Traditional Architecture” by Dr. Joseph Kamenju published 2013 in Oslo and available here. As can be seen from a study the plan, it is a simple geometry of a Square within a Circle in plan and a cone on top of a cylinder in form. 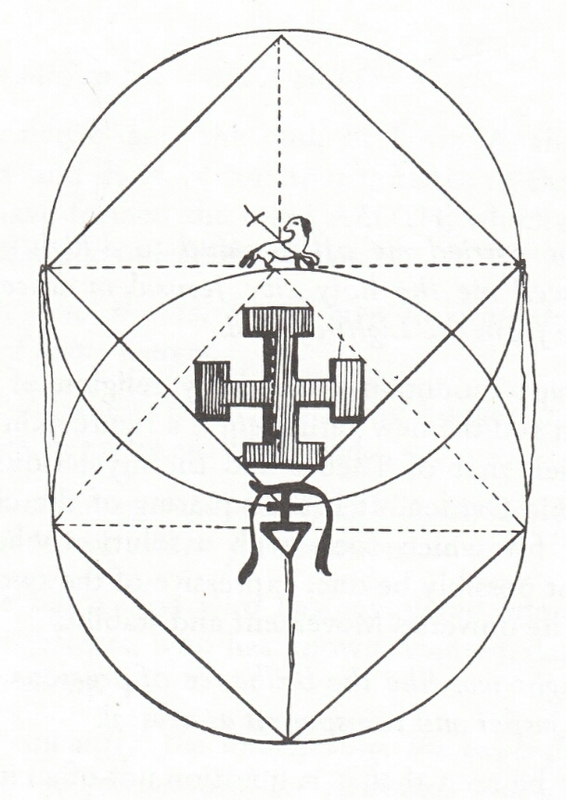 This kind of simple geometry is expected of complex universal symbols embodying cosmic meanings. 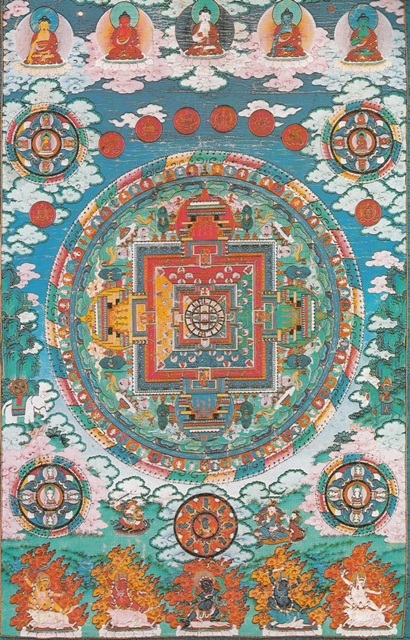 The World card in the Tarot, Yantras in India, the Christian New Jerusalem of the Apocalypse just to mention a few, are all sacred Mandalas, or patterns that represent mystical truths in geometric form. They usually incorporate a circle and a square and the central point. In the Nyumba, the circle stands for the Woman, the all-inclusive, container, fold, nest, the mother and sustainer of life, Mumbi. Mutumia is Woman in Gikuyu, and the adjective Gutumiria is to hold in the mouth, to contain. A Mutumia is a container. The Male Principle is the point which stands for the absolute, the locus, pivot, piercer, the central stake, muratho, at apex. Guthura is to point out, to point, thus Man in Gikuyu is Muthuri. 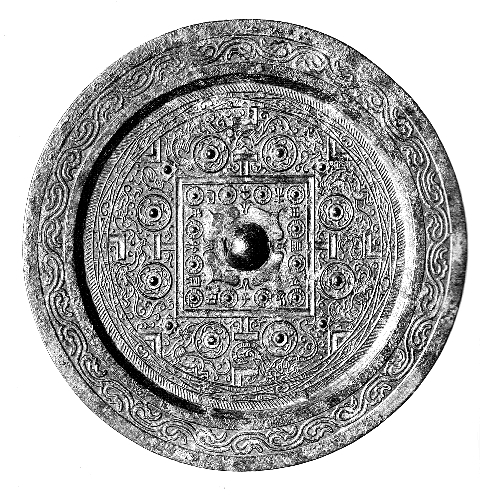 The entire Gikuyu mandala can thus be interpreted as interplay of the male and female principles. 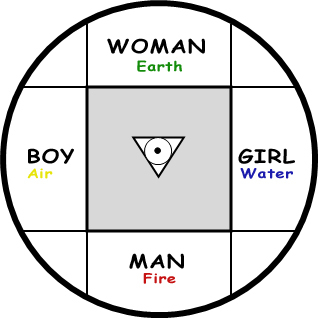 Universally, the four sides that arise out of the interplay of square and circle are the four primal elements of the planet earth, Fire, Water, Air, and Earth. The Gikuyu woman seated at the head of the cross is mother earth, Mumbi and she has stored all her clay pots in her private store, Thegi. The Girl is Water as she draws the water placed at her corner, Kibacia. The man seats at the Ruri side and that is where the firewood stack stands so he represents Fire. The boy seats at the Kweru side which is the only side of the square without a screen thus free flow of air, therefore he stands for Wind. At the centre is the hearth of three stones representing a combination of all four elements, Fire, Ashes wind and the water coming out of the firewood. If there is a round traditional clay pot cooking again, clay, water, steam and fire are all represented. The stirring of the cooking porridge with a stirring stick, Munduri is the great cosmic dance of male and female coupling. Gikuyu numerology accords odd numbers to the male gender and even numbers to the female gender. 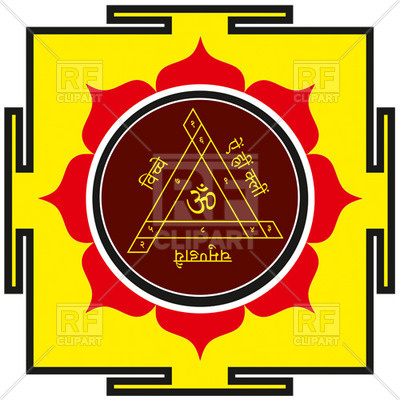 Thus the square is feminine in the geometry of circle and square and the masculine must be represented by the triangle formed by the three stones on which another circle of the clay pot sits and a point as stirring stick in it. That is why a girl is announced with four ululations and a boy with five. It is also why there is confusion as to the number of Gikuyu clans. From Gikuyu, the man’s point of view he sacrificed a ram over nine rods, ndara, an thus he got nine young men to marry his daughters. From the woman’s point of view they were and have always been ten daughters. Below are some numeric examples of the odd and even interpretations by the Gikuyu. If the boys place is at the kweru, it means that there bed was there. Were they not significant in the nyumba not to have a name of there bed like kiriri for girls?. There was no bed on the kweru side and the boys, (uncircumcised) slept on the floor with the goats. I thank you for the information you write about the Gikuyu people. Its very informative but the information of the hindu and other cultures seems to me to bring a confusion. Pure Gikuyu information without the writer’s personal view in relation to other cultures stands out unique but informing about certain cultures to prove your point seems to me to lower the quality of your presentation. Please dont get me wrong, I enjoy reading your work but that part of comparison does not help since Most readers prefer raw material and them making their own conclusion. For instance reading The akikuyu book by father Cagnolo I noticed he was biased in how he presented his material but reading the southern kikuyu before 1903 by Louis Richard, He presented raw unbiased material for us to understand our culture. So when reading Father Cagnolo work I have to read filtering out some information because he did not understand the culture well enough and judged according to his own culture. I appreacite his work but read it in my own lenses not his own. On the other hand Leakey only gave facts without interpreting in his own lenses what he read. Gikuyu people are unique and during the olden times when our culture was alive and active, the hindus and chinese had no contact with our people hence presenting information with other far fetched cultures kind of water it down if I may say. Prefer you to present fact and interpreting from only the old Gikuyu perspective is important. 50 years from now that information of comparison with chinese and hindus can be confusing to that generation. Lets all strive to present material in the perspective of the Gikuyu of the 1600, 1700, 1800 or 1900. Iam so glad Leakey presented facts that we can all fall back to and read without personal biases and perpective. I hope you receive this as good critism, your mukuyu wordpress actually is the most reliable website on Gikuyu people I have found so far. Thanks for your interest in our site and your comments. We agree that Leakey and our dear Father Cagnolo did a very wonderful documentation of the traditions of the Gikuyu from an anthropological point of view. We also agree that Leakey’s presentation is more devoid of opinion than Cagnolo’s therefore probably more scientific. Cagnolo’s work however though written with passion is not lacking in information and in many ways is superior to Leakey’s raw data-wise. We however are presenting a second generation reappraisal of the raw material and are far more interested in deduction and analysis. Whether such an approach is not helpful to future generations as you put it is open to question. The raw material documented by Leakey and our dear Father Cagnolo will remain for those sincere seekers of Truth but as for us here at Mukuyu, we find it more worth our time to delve into meanings and interpretations. In line with ongoing findings proving that Homo sapiens were from Kenya and spread out to rest of Africa, Europe and Asia the comparisons are relevant. The similarities in the artefacts go on prove this. However, have been fed with outright lies such as parting of the Red Sea for one to get to Israel or Europe makes Africans doubt such- not many can fathom the obvious truths these artefacts present. The book by Noah Halal is a good read on how the Homo Sapiens spread from Africa. Apart from the artefacts the fact that there are black Indians, Black Arabs, Maoris, Aztecs, Incas, the so called ‘Ethiopian refugees in Israel’ is also an interesting piece of the jigsaw. Hello, if you study sacred geometry you would understand where he is coming from. Because sacred geometry is everywhere… on our faces… leaves… all architecture… art…etc. Some call it the language of God. 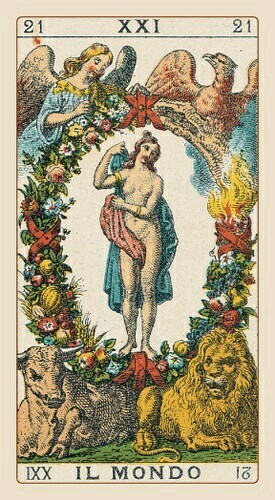 By him showing similarities with other cultures, it is by no means showing lack of uniqueness… it is just showing how kikuyus used to be smart and how we understood esoteric knowledge. There is no rawness in sacred geometry… it is everywhere and appears similarly in every culture. Hi. Thank you for your sharing of this knowledge. For the second generation agikuyu I found it utterly invaluable. Would you be ki d enough to share how one would obtain the complete work of leakey “the souther agikuyu”? Or other complete works of the Agikuyu story. Thank you. The Akikuyu by F. Cangolo has also been republished under the same name by Father Hilary Wambugu and is available in major bookshops in Nairobi principally The Catholic Bookshop. Leakey’s books have been republished as was, letter for letter as completely faithful and honest copies. However, that by Father Hilary has been completely edited to remove Cagnolo’s racist an obnoxious language which makes the publisher a shameless parvayer of lies and untruths of the true history of the Catholic Missionarie’s view of the native peoples. (Imps according to Cagnolo). To second generation readers not having the 1st edition at hand, this is dishonesty of the highest degree. A rewriting of history.